The EC2 Right Sizing report helps you optimize the size of your EC2 Instances by providing recommendations and a Request Fix button for EBS-backed instances only. In general, requesting a fix opens a Workflow. Users with the Admin Workflow permission can approve or reject a request. Users with the Open Workflow permission are only allowed to make a request. Users who do not have either of these workflow permissions cannot make requests. 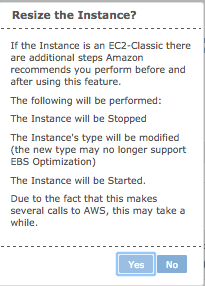 If the instance is an EC2-Classic or an instance store-backed instance, there are additional steps Amazon recommends you perform before and after using this feature. 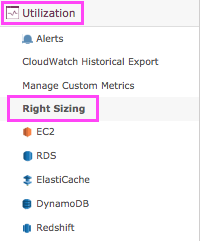 Learn more about AWS' details for resizing your instances here. 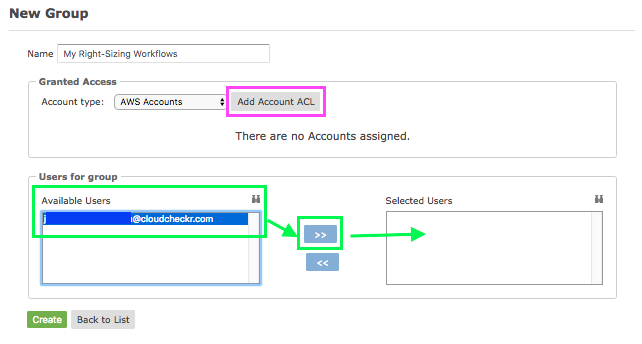 Before you are able to make any EC2 Right Sizing changes within CloudCheckr, you must ensure that your AWS account has the appropriate policy permissions and that you have given your CloudCheckr users the correct permissions to start a Right Sizing workflow. The configuration process for enabling permissions to perform Right Sizing actions is detailed here. The Right Sizing report is located in the Utilization module, under Utilization > Right Sizing. The main screen of the Right Sizing report gives you a summary of all the instances that have right sizing recommendations. You can filter the list of instances in the same way as a standard Inventory report. You also get utilization data for the instances in question, including a Utilization Score. Low scores indicate that an instance is underutilized, whereas high scores indicate that an instance is overutilized. You'll see that you also have a Request Fix button, which is where you can get the whole right sizing process started. For the most complete resizing recommendations, it is ideal to use CPU, network, and memory utilization metrics. 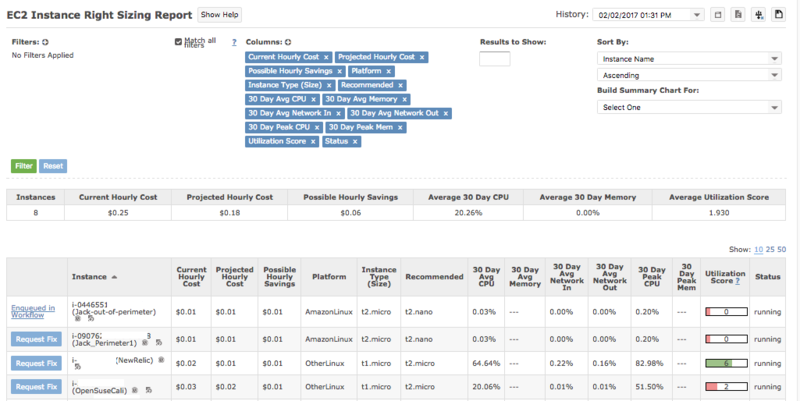 CPU and network data are provided out-of-the-box from AWS (once turned on) via CloudWatch. In order to get memory metrics, AWS requires you to install an agent on your EC2 instance to generate custom CloudWatch metrics. CloudCheckr can then ingest this data and use it for reporting and recommendations. You can get more info on monitoring memory metrics here. Choose an instance on the list and click the Request Fix button. A confirmation pop-up with information about your action will display. Click Yes to continue. 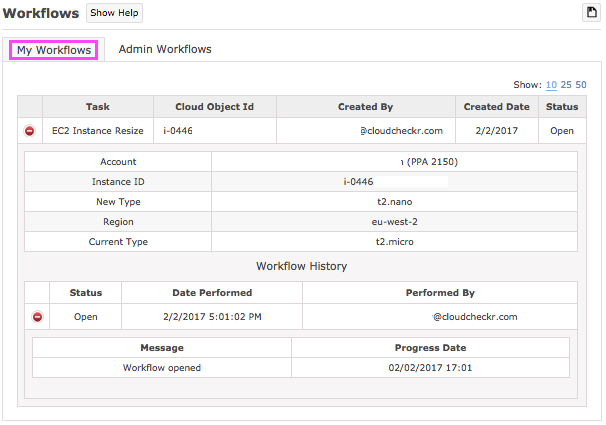 Once you have started the process, you will see that the EC2 instance in question has a request that is Enqueued in Workflow. Click the link to get more info on your workflow. 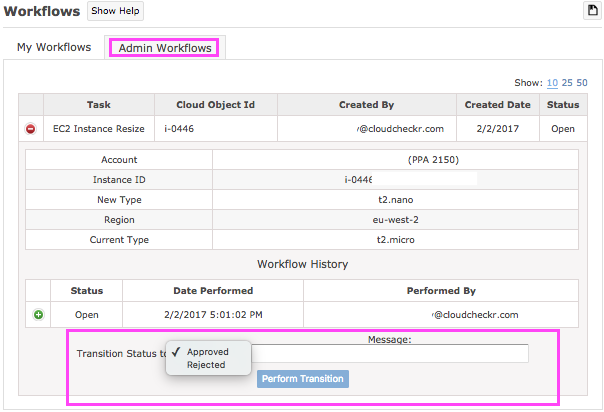 Users with Open Workflow permission will see their requests under the My Workflows tab. They will be able to see all the characteristics of the EC2 instance in question and the status of their right sizing request. Users with Admin Workflow permission will see their requests under the similarly-named tab. A key next step for Admins is to Approve or Reject the requested EC2 transition. There is also a Message field where the Admin can give feedback to the user regarding their request. Click the Perform Transition button, and the right sizing process will begin. The user who had requested the right sizing change will receive an update in their workflow describing the status and when any update occurred.